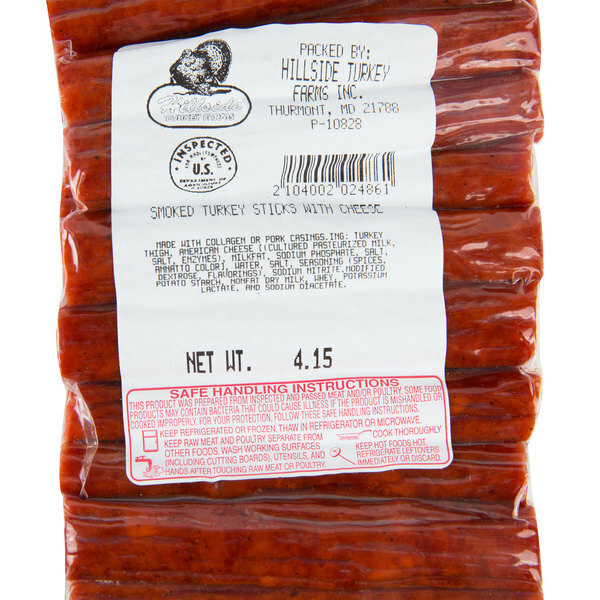 Provide your customers with a savory snack unlike any other with these Hillside Turkey Farms smoked turkey sticks with cheese. 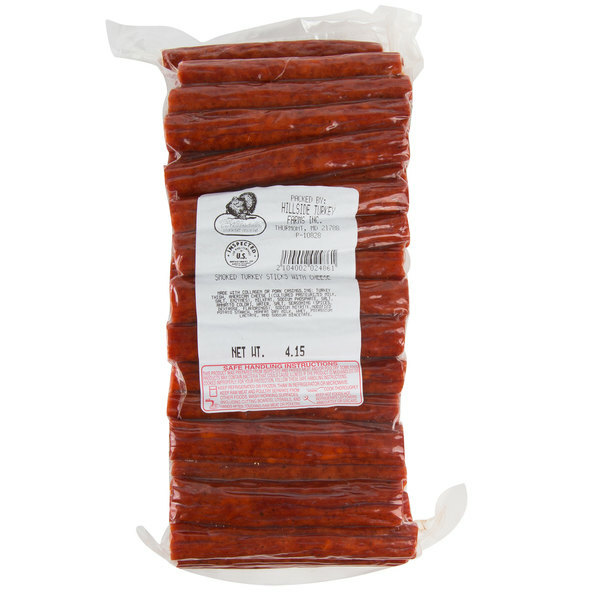 Featuring a chewy, toughened skin, with a tender, meaty inside filled with cheese, these turkey sticks have a slightly smoky taste and aroma to accentuate the hearty and satisfying flavor of the meat. Plus, these snack sticks are high in protein and low in fat, making them a truly delectable snack at any point in the day! 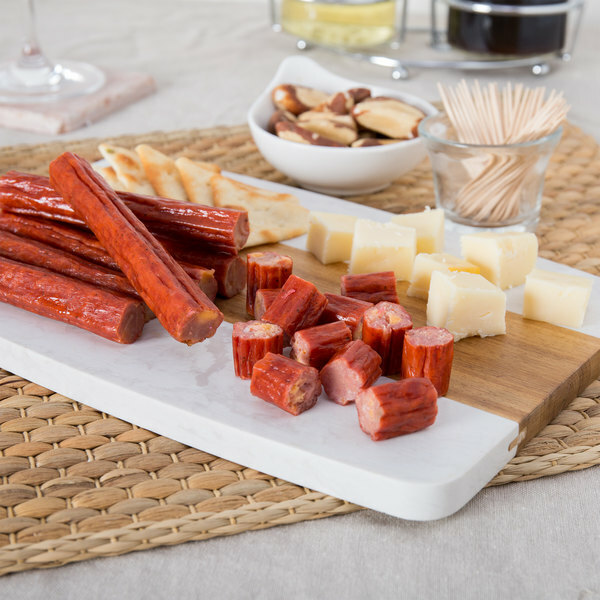 Serve these plain at your deli or cafe, or for a protein-packed snack, try pairing it together with cubed cheddar cheese, grapes, and pretzels to create a fresh, healthy snack tray for customers to take with them to their next destination. 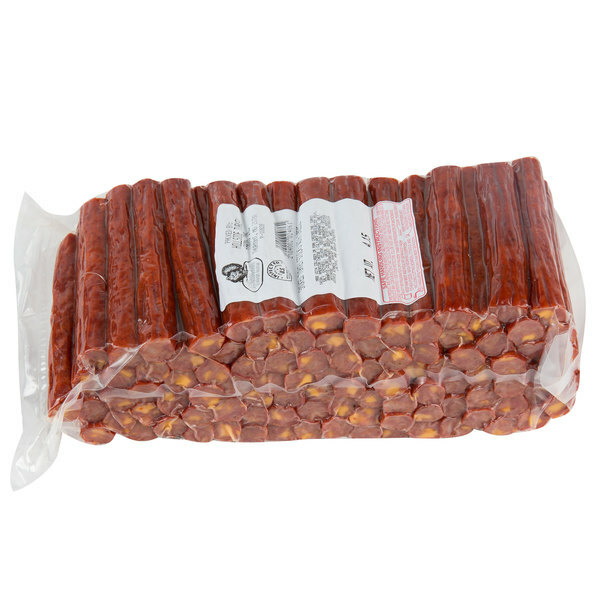 These turkey sticks come fully cooked and ready to eat, and are in a vacuum-sealed bag to maintain optimal freshness. Plus, the 4 Ib. bag ensures you always have enough on hand to satisfy customers demands. 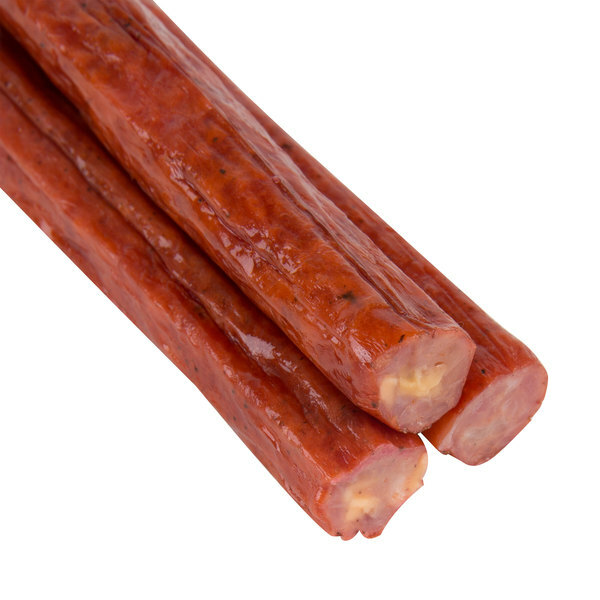 Keep your deli counter stocked and always ready to offer customers a tasty treat with these smoked turkey sticks with cheese. Located in Thurmont, Maryland, Hillside Turkey Farms is a USDA inspected, third generation family-owned farm and plant, specializing in delivering premium quality turkey and poultry to the market. Founded in 1939 after selling a turkey on Thanksgiving, the farm today has the capability of raising up to 180,000 birds per year. Its turkeys are antibiotic-free and are not injected with anything, like oils and fats. Raising turkeys with a taste so renowned, Hillside Turkey Farms products are sure to leave guests craving more! These turkey & cheese sticks are delicious!! Perfect for snacking or serving to company. We freeze them in batches of 10 and thaw in the fridge when we run out :) These freeze very well and last in the fridge for about a week. Will be buying these regularly!